Your privacy is of great concern to CrateEngineDepot.com. We use the information you provide to process your order and to ensure that your experience on our site is as enjoyable and efficient as possible. Our primary focus and greatest concern is you, our customer. We respect your privacy and therefore do not sell, rent or loan any of your personal information to any third party. We are committed to protecting your privacy. We use the information that we collect about you to process your orders and to provide a personalized shopping environment. The Information We Gather and How we Use It Our system automatically gathers information about the areas you visit on our Internet store. We do not use any of the navigational data that you as an individual provide while browsing or shopping on the internet, nor do we share this data with anyone outside our company. We do use navigational information in the aggregate to understand how our visitors shop in our store so we can make CrateEngineDepot.com better. We may also use and store information you give us (e.g, your shipping or billing address) so you do not have to reenter it each time you visit. In order to fulfill your order and provide you with the highest level of customer service, we must ask you for personal information. 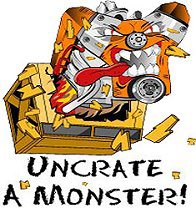 CrateEngineDepot.com collects your name, shipping and billing addresses, telephone number, e-mail address and credit card information in order to deliver your order promptly and to the correct address. We use your e-mail address to send you a confirmation of your order. We will also send an e-mail when your package is shipped and include the shippers tracking number. CrateEngineDepot.com does not disclose, share, sell, or trade any personal or individual information that it collects to third parties.